We might not have any mountains but we are lucky enough to have some great hills for sledding and tubing. One of our favorite spots happens to be part of the Three River Park District. Elm Creek Park Reserve is located near Maple Grove. We like that they provide the tubes and having a magic carpet to get back up to the top. 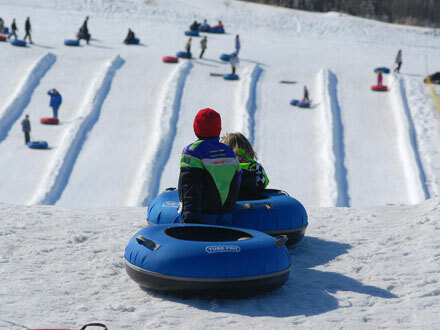 Elm Creek is hosting a Tubing with Teens event this coming Friday from 6-9pm. There’s a small fee for this evening of fun, only $5 and it’s well worth three hours of fun! It’s important to note that only 200 passes will be sold at this thrifty rate so you might want to plan ahead and purchase your pass. The event is for kids 12-19. **Each Teen needs to have a parent waiver signed. Hot cocoa will be provided and there will also be a nature photography contest which you can read about here on the event FB page. A selection of board games will be available indoors. 6:00PM – Tubing Passes can be purchased for $5 by teens with tubing lasting for 2 hours from the time of purchase. Only 200 passes will be issued at the $5 rate. 8:45PM – Winner is announced.